In the old days, pizza in New York City essentially meant one of two things: either thin triangular slices (commonly known as New York-style pizza) or thick doughy squares (aka Sicilian). 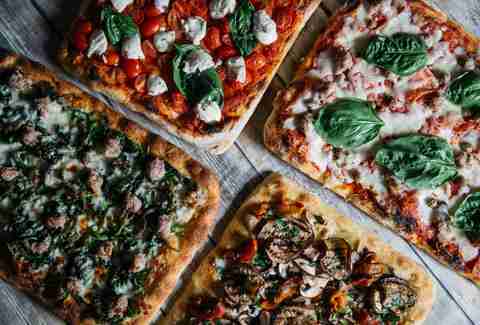 But, over the past decade or so, the city has seen an influx of various foreign pizza styles that don’t really conform to the typical New York pizza experience -- from traditional Italian varieties to bizarre Midwestern interpretations. Here’s a handy style guide to help you navigate this brave new world of non-New York-style pizza in New York today. What it is: The precise history of this style -- which literally translates to “round pizza” in Italian -- is hard to pin down, but it became popular in Rome sometime after World War II, thanks to the influx of strong, high-protein American flour. It’s cracker-thin and crunchy at the edge, yet soft and flexible at the center. The dough is usually stretched with a rolling pin to achieve a density that differentiates it from other Italian styles. Pies are small, about 12-14in in diameter, and work great as personal pizzas or as appetizers in restaurants that offer a full menu. How to know it’s good: Look for thin crust with a light char. Beware of dusty crusts caked with excess flour, which tend to taste bitter. Where to get it: The most popular spot is probably Danny Meyer’s Marta, but Gnocco has been doing it for more than a decade in Alphabet City. 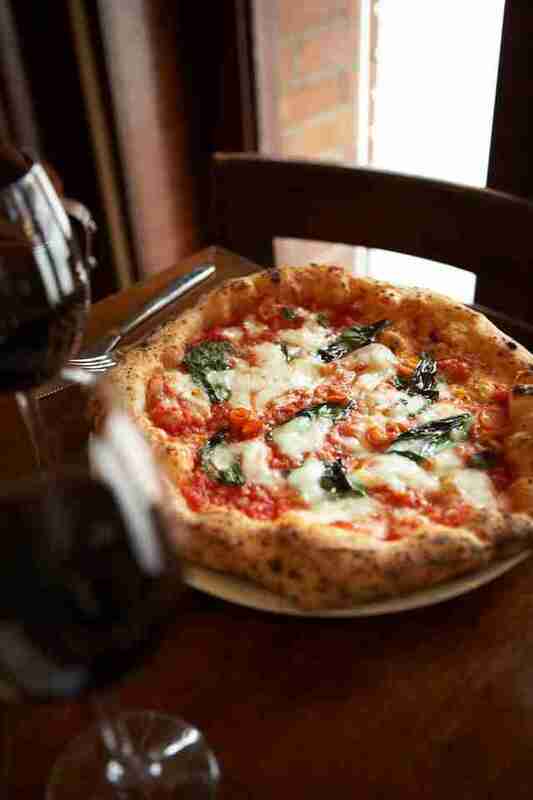 What it is: Like pizza tonda, this style is another creation of post-war Rome. 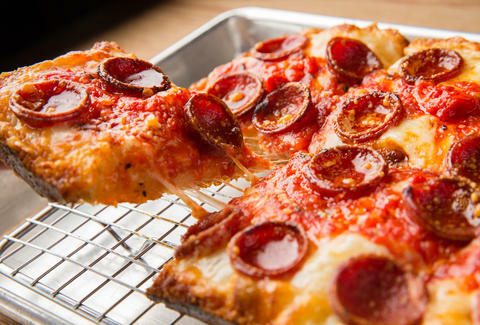 In New York pizza terms, it’s most similar to Sicilian pizza. Both are thick, rectangular, bready pies baked in moderately heated ovens at around 500 degrees Fahrenheit. Like Sicilian pizza, pizza al taglio is baked in a pan and served by the slice (al taglio literally means “by the cut”). Where they differ is their ingredient makeup. Pizza al taglio is built on a base of extremely wet dough. Unlike New York squares, which get topped with shredded low-moisture mozzarella and cooked sauce, pizza al taglio has a lighter dressing of fresh mozzarella and uncooked tomato. Additional toppings tend to be a slightly more gourmet variety than your usual pepperoni or sausage. How to know it’s good: Eyeball the pizza’s cross-section. You’re looking for big holes to indicate an open crumb structure, meaning the pizza will be light. Where to get it: Prova in the dining concourse of Grand Central Terminal and My Pie on the Upper East Side. What it is: Pizza as we know it developed on the streets of Naples by the early 1700s, when bakers used topped dough discs to cool down the floors of their overheated ovens. The last 15 years have seen a massive comeback in this style, particularly in New York. It’s the personal-sized pizza that gets baked in a super-hot wood fired oven for just 90 seconds. The edge is puffy and thick, but the center is thin. The overall pie is soft because of its short bake time and sometimes a bit wet in the center (also thanks to the fast bake). Toppings on Neapolitan pies are sparse but fresh. Where to get it: Kesté, Sottocasa, Tavola, Ribalta, Song’ e Napule, and Rossopomodoro. What it is: These thin, rectangular pies are baked directly on the oven floor and sold either whole or by the slice. The style is said to have started at Pizza a Metro da Gigino L’Università Della Pizza in Vico Equense, just outside Naples, where the lengthy pies are baked in wood-fired ovens. 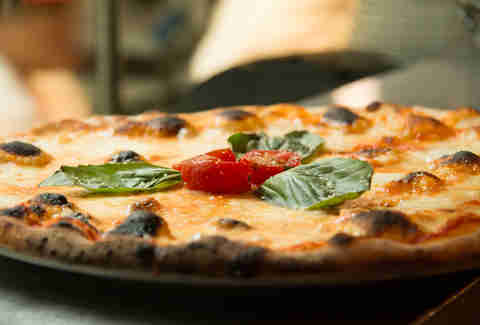 Like most other Italian styles, pizza alla pala is delicately topped with fresh Italian ingredients. How to know it’s good: The pie should be thin but not entirely stiff, with a noticeably raised crust along the perimeter. 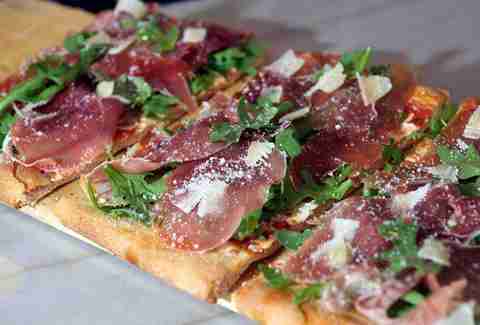 Where to get it: Farinella, Merilu Pizza al Metro, and Numero 28 (the Park Slope location). What it is: This style is common in New England, where Greek immigrants adapted it with some of their own flavors in the 1960s. These round pies are thicker than the typical New York-style pizza, as the dough sits in round pans and rises before baking. They also tend to be greasier than other styles, thanks to a generous amount of oil in the dough and lining the baking pan. 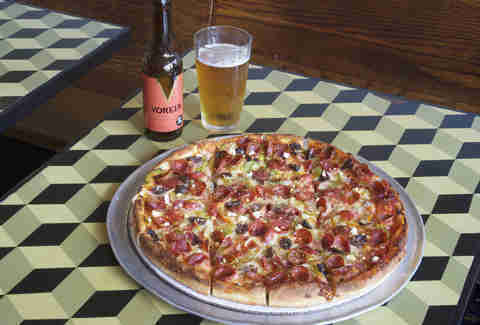 Greek pizza’s thickness makes it perfect for loading on toppings. The result is hefty, hearty, and (surely to the dismay of most New Yorkers) not at all foldable. How to know it’s good: You want a pie that’s more robust than the average slice, yet not so oily that you need to bust out extra napkins. Where to get it: Archie’s, Boston Pizza, and Scarr’s (ask for the personal pan pizza). How to know it’s good: Look for a blackened cheese crown along the perimeter and an even golden hue on the crust. 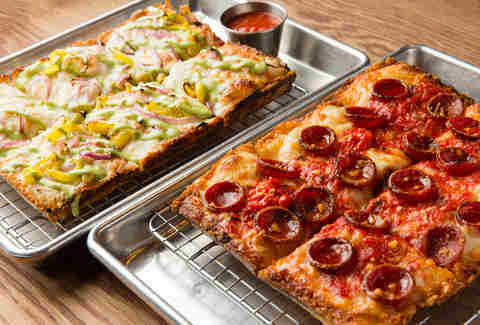 Where to get it: While Emmy Squared is probably the most talked-about place doing Detroit-style pies right now, Nino Coniglio (of Williamsburg Pizza and the Brooklyn Pizza Crew) has also been experimenting with limited edition “Not Detroit Style” pizzas every night at his post in the coat check room of 310 Bowery Bar. What it is: Before you go spouting off about how deep-dish isn’t even pizza, think about the basic components. It’s dough that gets stretched, topped, and then baked. Just because you can’t eat it with your hands while walking down Mulberry St doesn’t mean it’s not real pizza. This is a high-ridged pan-baked monster filled with cheese, toppings, and finished with a stewed tomato sauce. The style goes back to the early 1940s, when it was introduced by a pizzeria that later morphed into the Uno chain. The original idea was to transform the dish into a full meal; it was previously thought of as more of a bar snack in the midwest. How to know it’s good: The pie should be dense and biscuit-like rather than thick and fluffy, with the sauce on top (or else, it’s just a thick pizza). Get it with sausage for the authentic experience. What it is: Before the massive chain pizza companies took over the Midwest, native pizza was thin, round, and cut into squares (the so-called “party cut”). It was originally served in bars as a snack, but later came to prominence as a popular kids’ birthday party meal. Imo’s in St. Louis is credited with introducing a variation of this style that subbed in a bizarre local cheese called Provel -- a blend of Swiss, Cheddar, and provolone. Locals love Provel cheese but non-natives tend to find its globby consistency unsettling. Regardless of how one feels about the stuff, it’s clearly the defining element of the style. How to know it’s good: Provel cheese has a distinct tangy flavor, which is something of an acquired taste, especially if you’re not from St. Louis. 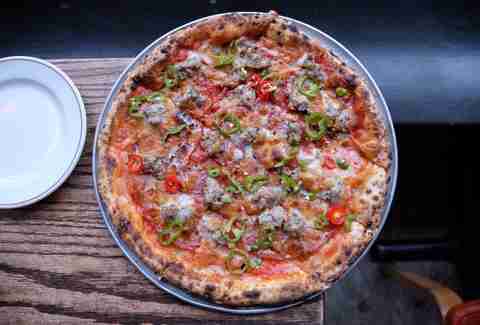 Where to get it: While it’s not a 100% true St. Louis-style pizza, the Saint Louie pie at Speedy Romeo is about as close as you’ll get. The restaurant even imports the Provel! Scott Wiener is the founder of NYC-based Scott’s Pizza Tours and author of Viva La Pizza! The Art of the Pizza Box. He’s still trying to acquire a taste for Provel cheese. Follow him on Twitter (@scottspizzatour) and Instagram (@scottspizzatours).